When apples start to fall from the trees and the hawthorn bushes are weighed down with fruit, you know that autumn has truly arrived. Apples are such a big part of British fruit growth that Apple Day, held on October 21st, has been celebrated every year since it began in 1990, and sloes are regularly used to make a variety of jams and jellies, as well as wine and, popularly, sloe gin. If you don’t fancy making your own sloe gin, or if you’re struggling to find a decent crop near you, then don’t worry: there are other alternatives available. Gordon’s Sloe Gin was first launched way back in 1908, but a brand new version has brought it back to life. Enjoy the dryness of Gordon’s with the sweetness of cassis in a clear bottle that shows off the rich, dark berry colour of the drink. For a truly autumnal cocktail, try Gordon’s Sloe Gin with apple juice. This recipe blends the tart, fruity flavours of Gordon’s Sloe Gin with the sharp sweetness of fresh apple juice for a great serve – either for parties or enjoying at home on cold autumnal evenings. 1. Using a jigger, measure 50ml Gordon’s Sloe Gin and pour into a tall glass filled with ice cubes. Top up with the apple juice. 2. Using a chopping board and a sharp knife, cut a lemon wedge as a garnish. Squeeze and drop into the glass and serve. 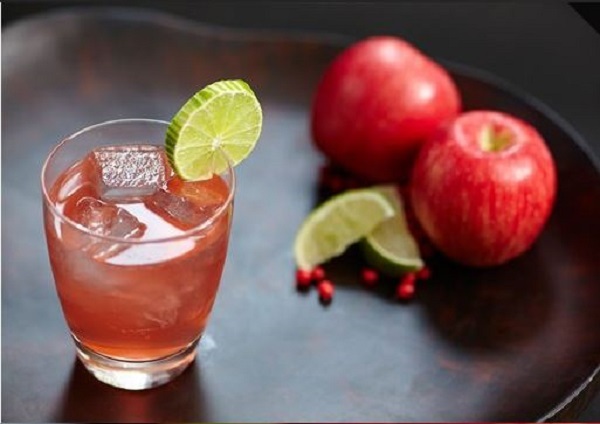 For more great cocktail recipes for autumn and the rest of the year, visit https://uk.thebar.com: a great website from Diageo that showcases the versatility of a range of different spirits including gin, rum, vodka and whisky. A very timely recipe.Saves me looking it up on the web. The sloes seem to be ripening earlier this year. Some are ready now, whereas it is usually the first week to third weeks in October.